Gosh – first of all, Happy New Year! I hope this year is a happy and creative one for you all. I’ve been really slack at blogging last year, but I am keeping up regularly on Instagram, so do come and say hello on there if you are an Instagrammer! Now and then though, I feel the need for more words than you can put on Instagram, and this quilt calls for one of those times. 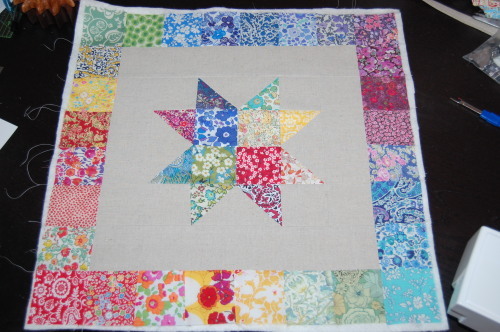 It isn’t my design, in fact a lot of folk have made a “Low Volume Plus Quilt” before, but since I changed the measurements from what you can find on google to be charm pack friendly, I thought I would include those measurements here. 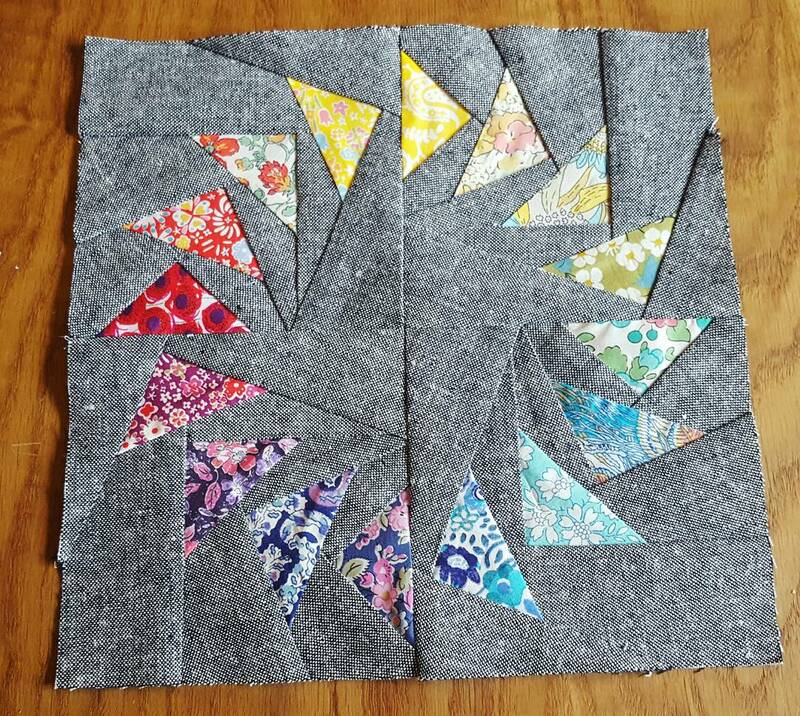 A scrappy low volume quilt has been on my radar for a few years now; but I realised that in doing so many fairs and commissions, I had accumulated a great stash, but had had no time to do any of the selfish sewing I had wanted to for a while… suddenly 2016 felt like the right time to try some of those long-awaited projects. Just before Christmas and New Year. Well, the muse strikes when she strikes! Excuse the terrible image! I made it on Word, but then couldn’t work out how to save it as a jpg to insert – ended up taking a photo of it. I’m not going to win any awards for tech any time soon! 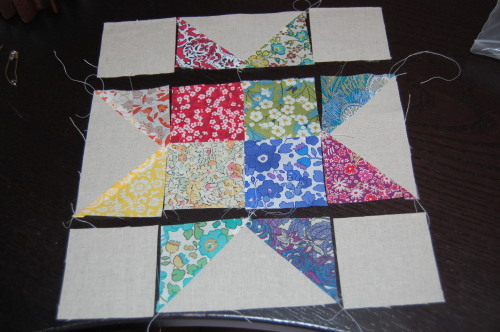 Obviously for the bright crosses, you can’t use charm squares – unless I guess you used five 2.5″ squares of the same colour and increase the scrappiness! That would look cool too. 120 low volume fabrics, cut into 4.5″ squares. I liked making mine as individual blocks, so that’s how I will describe it, but obviously you could chain piece them all if you like. 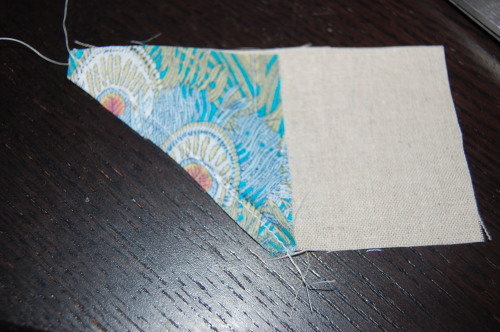 Sew using 1/4″ seam throughout. 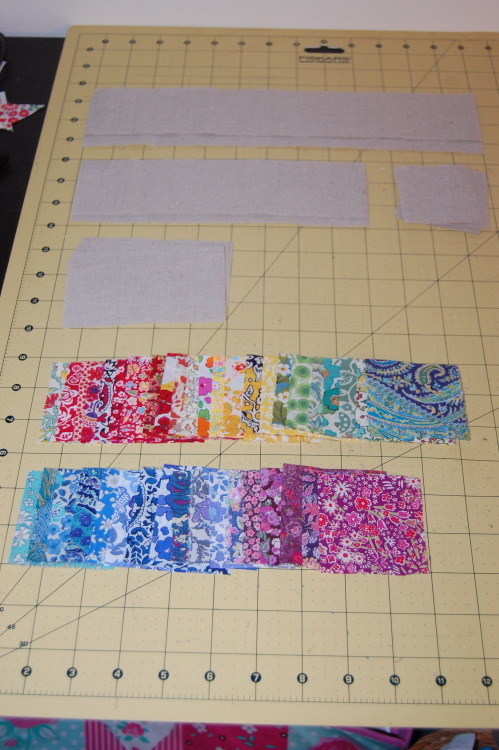 First cut your printed fabric strip into one 6.5″ x 2.5″ piece and two 2.5″ squares. 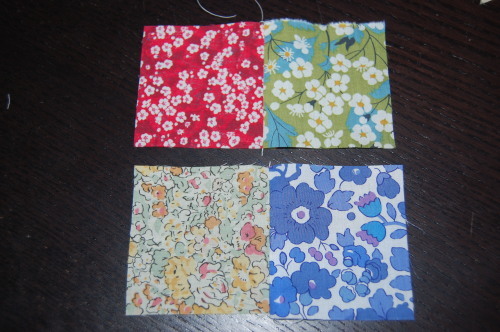 Sew a low volume 2.5″ square to each of the printed 2.5″ squares, and both ends of the printed rectangle. ~Ta-da! Easy-peasy. 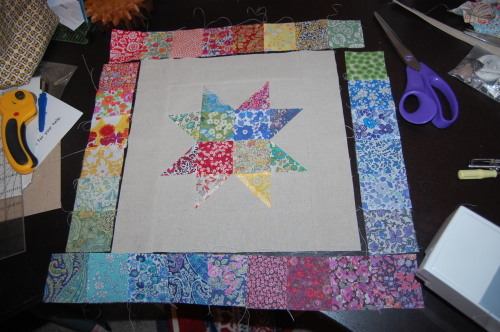 The block should measure 10.5″ square and will finish in your quilt at 10″ square. And OH MY. Look at that backing. It’s my current favourite print – a grey/navy floral from Tilda’s Memory Lane collection. 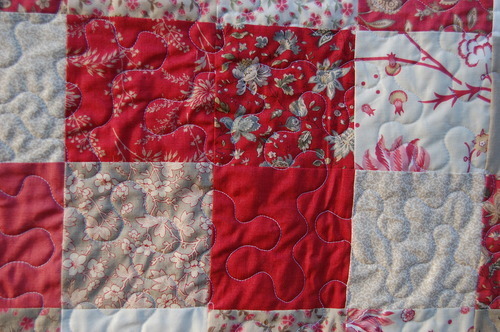 It is a definite indulgence, but I’m so happy to have a whole quilt back with it. I love the back almost as much as the front! Because the back is so dark, I didn’t want the thread to be too visible in the bobbin. 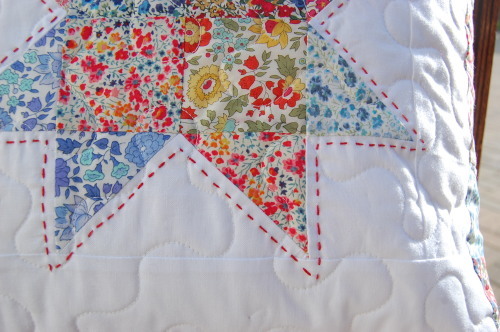 So I used The Bottom Line thread in white by Libby Lehrman for Superior threads – it is a 60wt polyester which has given a beautiful subtle quilting line in my print, not too obvious in the navy but keeping the pink flowers fresh and clean. In the top thread I used one of my favourite cotton threads – Konfetti 50wt Egyptian cotton thread by Wonderfil which doesn’t break in my machine unlike, sadly, Aurifil does. And a size 70 topstitch needle. 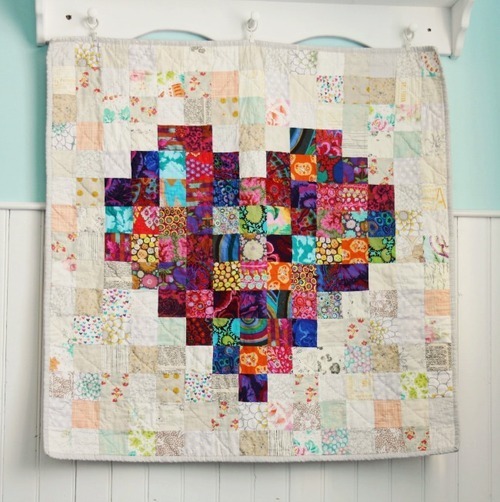 Thread can make such a difference to a quilt – especially when you don’t want to detract from the prints or busy up the design too much. So important – but I do agonise over it sometimes! I’m off to snuggle it, and hopefully also the wearer of those battered old shoes which you can see below that quilt! Wishing you all a wonderful 2017. I blame and thank Instagram in equal measure for my absence; on the one hand it has inspired and renewed my creative life, on the other I can see how easily it could be the death of the blog. 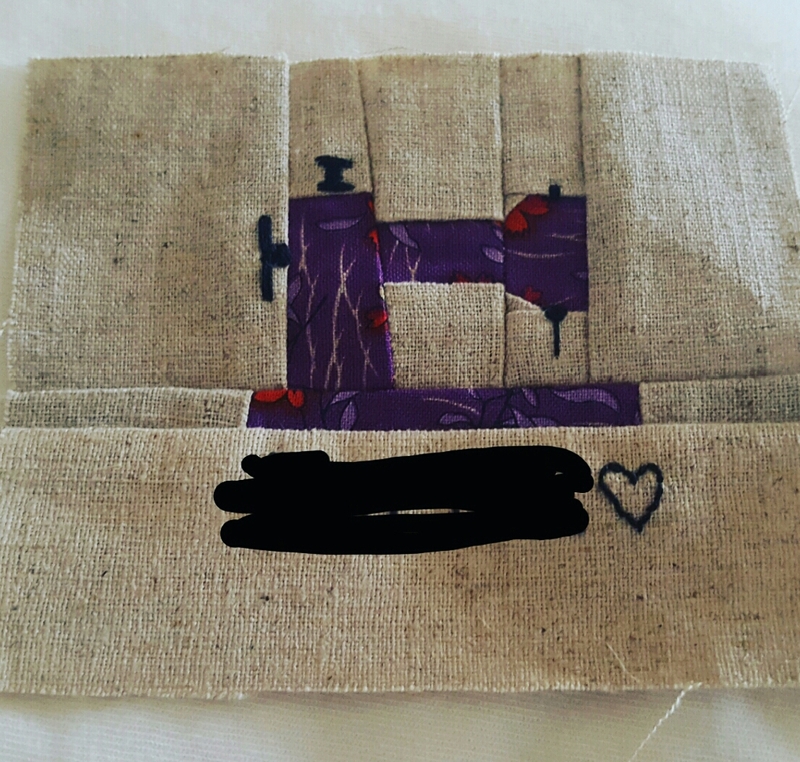 In a few short months of being addicted I have become part of a genuinely interactive and inspiring sewing and quilting Instagram community, one within which you make real friends. It’s so quick and so immediate in its reach and feedback. And yet, on reflection … blogs still feel important. The story behind a project, the details, the tutorials, time taken to tjink about a topic – I learn and I’m inspired so much from the blogosphere; even my small blog gets many hundreds of visits a month, even when I’ve had a hiatus. 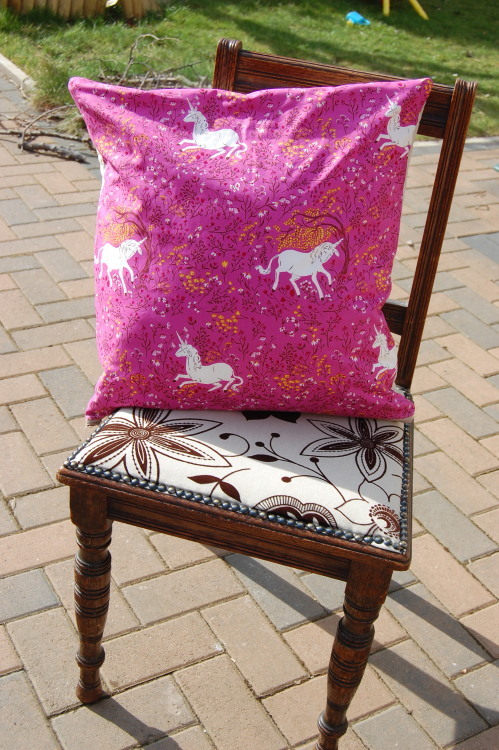 I think we sometimes need more than a quick eye candy sewing fix, addictive though that is in itself. So Cuckooblue is still here, even rising, baby-giraffe-like like a Phoenix. It is possible I may be over using metaphors in my zeal. 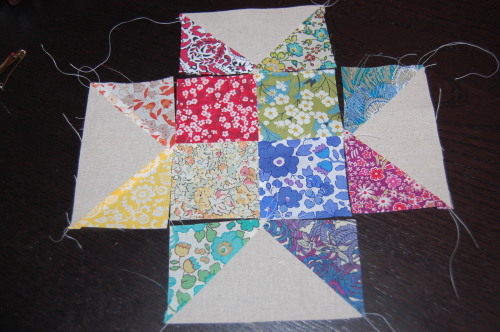 So this one is about Foundation paper piecing (FPP). It’s a pretty old technique, in which you sew onto marked lines on paper, rip off the paper and are left with some amazingly intricately pieced blocks, or blocks which would be difficult to piece by traditional methods. I don’t know if it is having a modern day resurgence, but it seems to be everywhere just now. This was my first attempt at FPP. It’s a pattern called “Goosing around” which is created by the incredibly talented Jeliquilts; her immediate download PDF patterns are available for a few pounds at the link below, and I thought this was a great first pattern for me. I just printed it off onto ordinary printer paper, but you can use foundation paper too which is supposed to be easier to rip off afterwards. 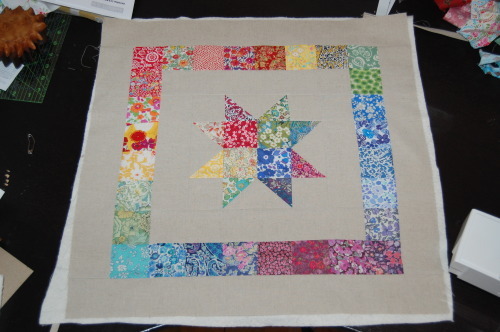 This pattern is made up of 4 blocks which you sew together to make an 8.5″ block, as directed in the pattern. 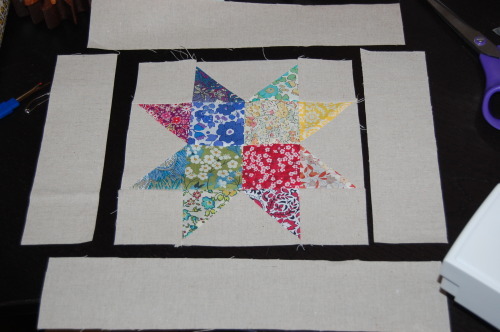 The technique does take some practice and you need bigger fabric pieces than you’d think, especially at the beginning – it is such a different way of thinking about making a block. The best way is to learn from a video tutorial, I think. I used this video by Karen Johnson of Connecting Threads; the “add a quarter ruler” and postcard method which she uses I think makes it much easier. It’s for a swap; in a month’s time I will be going to the Stitch Gathering 2016 in Edinburgh – a day of stitching classes (I will be doing my first ever sewing class – a little scary but also quite exciting!). 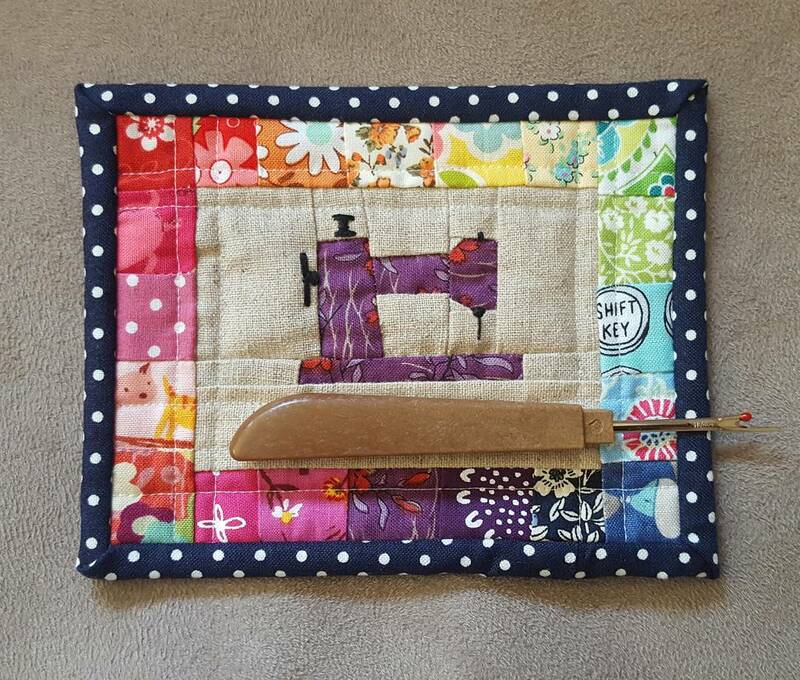 There are secret swaps organised – we each make a potholder (trivet) to swap with our allocated person (they don’t know who is sewing for them) and a nametag for a different person – perfect opportunity to practice some FPP I thought! 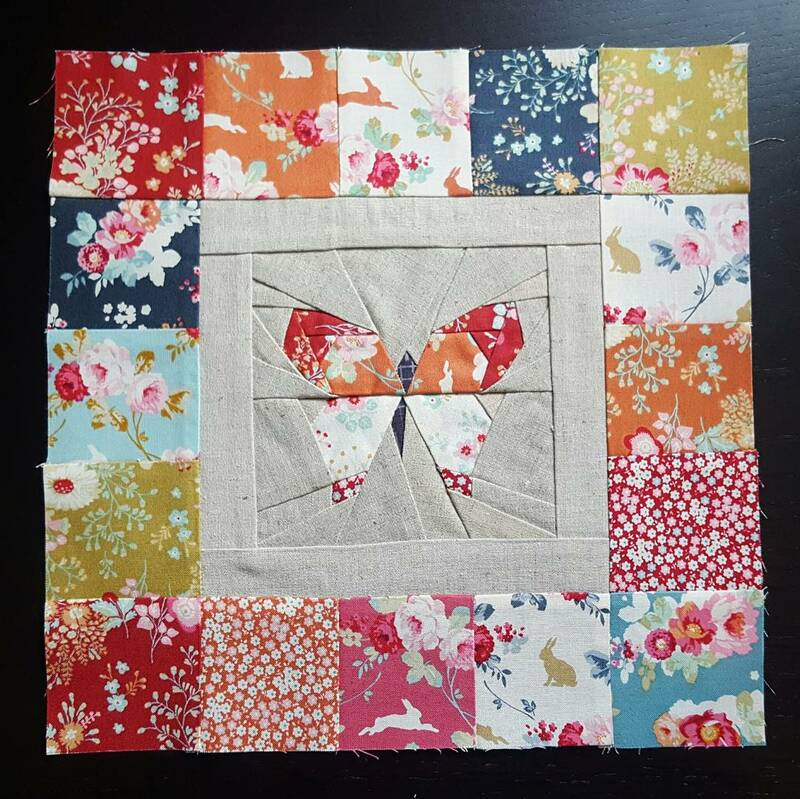 I was going to quilt the “goosing around” block for my potholder swap, but I shamelessly stalked my partner’s pictures on Instagram and decided she would prefer the butterfly. This is mine in progress. 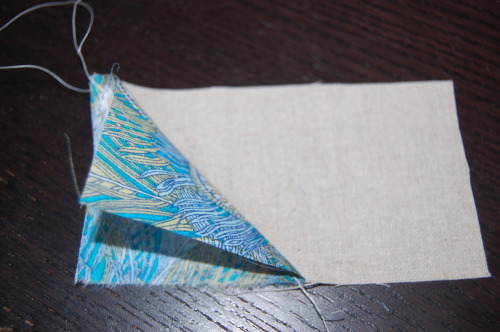 See how you sew along the pattern lines and then remove the papers? I am still a real novice at this; But going carefully and slowly really does do the trick. 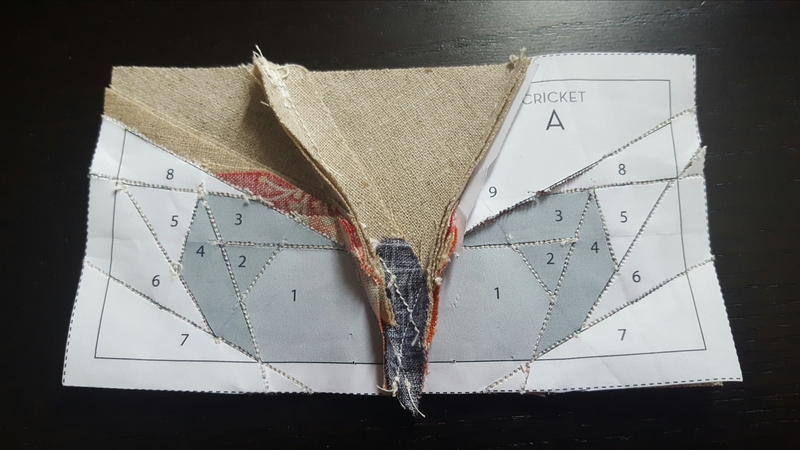 I *might* have had to re-do some messed up sections in this one though…I would say have plenty of fabric and time and be prepared to re-do some when you are first starting out with FPP! 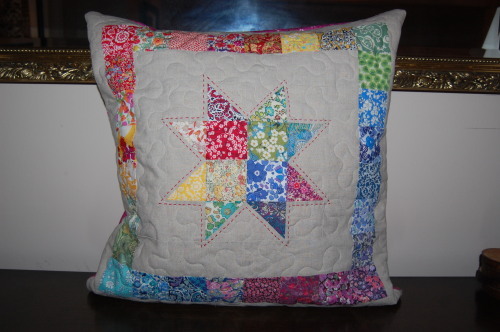 I used the new collections out by Tilda Fabrics, Memory Lane and Cabbage Rose. I cannot tell you how much I ADORE these collections! Prettiest Tilda fabrics ever, which is saying something. Prettiest fabrics ever, possibly. I’m really taken with them. 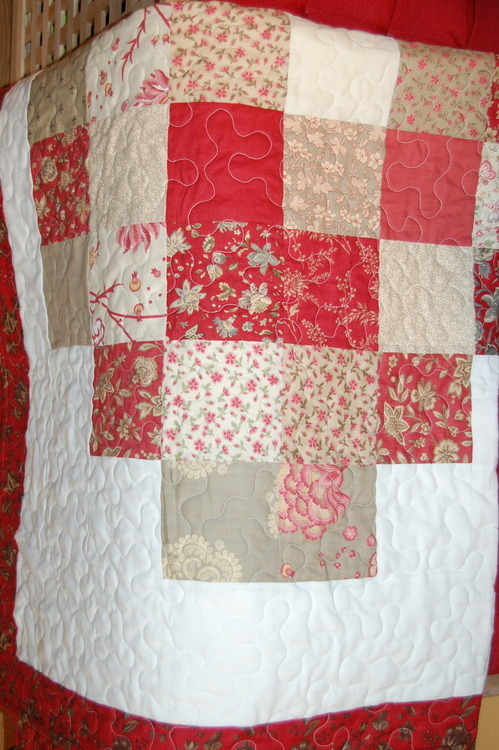 I used insulated batting and a mixture of machine straight lines and hand quilting with perle cotton #8. 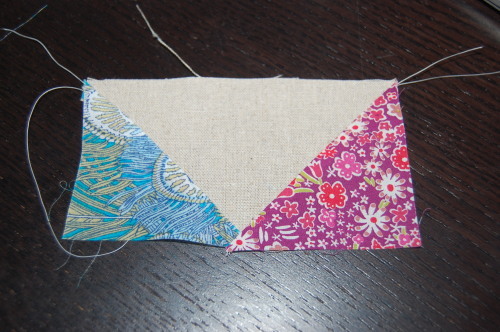 I LOVED using my tiny scraps to make a rainbow border. 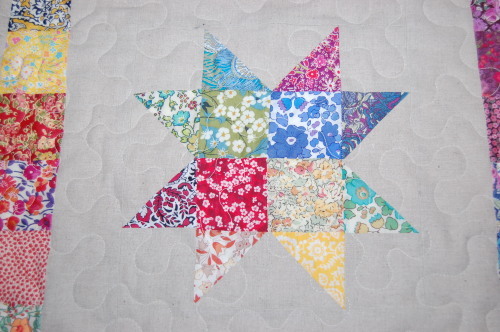 The scraps really are tiny, cut to 1.25″ square; only just big enough to include a kitten head, puppy kiss, turtle, typewriter key, flowers… I quilted with Superior thread’s The Bottom Line, a fine but strong polyester using white in top and pale blue in bottom bobbin (as the back is those blue kissing dogs). 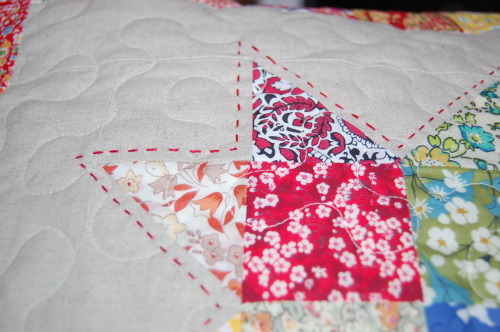 Impressed with the unobtrusive quilting line it makes – I would recommend the thread if you’re happy to use polyester! 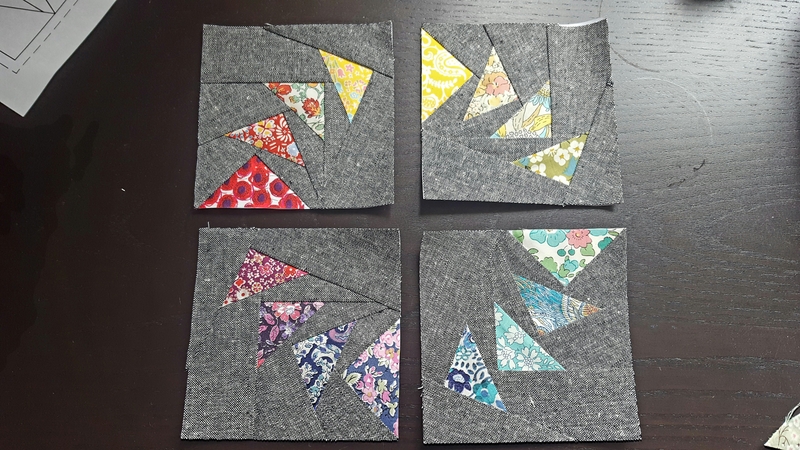 I hope you get inspired to maybe try a little FPP yourself if you haven’t already, whilst I can’t currently see myself doing a whole quilt with this technique (some people do! ), it is really fun. 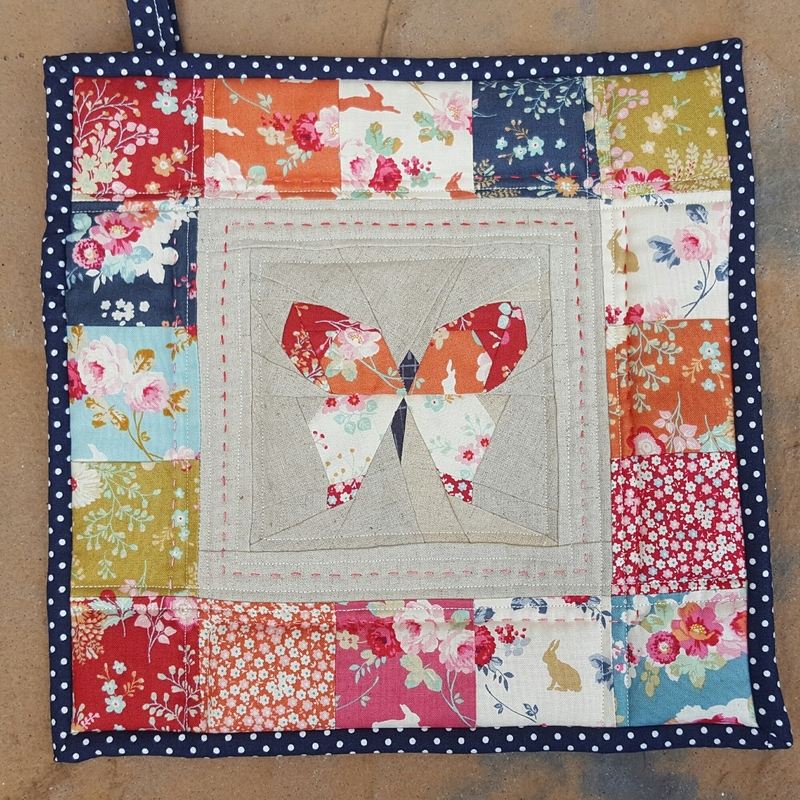 Those butterfly blocks are charm square size too – I can see all kinds of possibilities with this technique! The Pattern is Pixelated Heart by the amazing Blue Elephant Stitches. I hope the happy couple love this sweet pattern as much as I do! 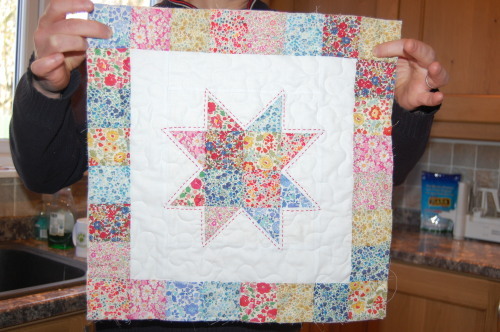 This is her quilt, made with low volume fabrics instead of white fabrics (I didn’t have the budget for that) – it is utterly stunning! She is SO talented, seriously you should look at her blog. 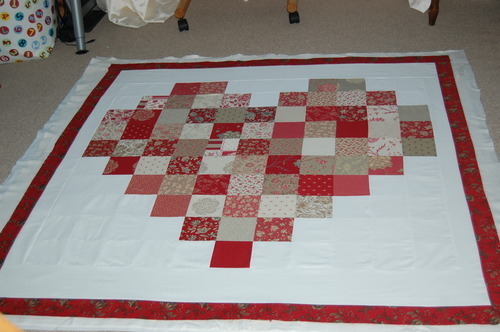 And so generous – look how she breaks down this quilt for us to make it easier to sew as blocks rather than strips! 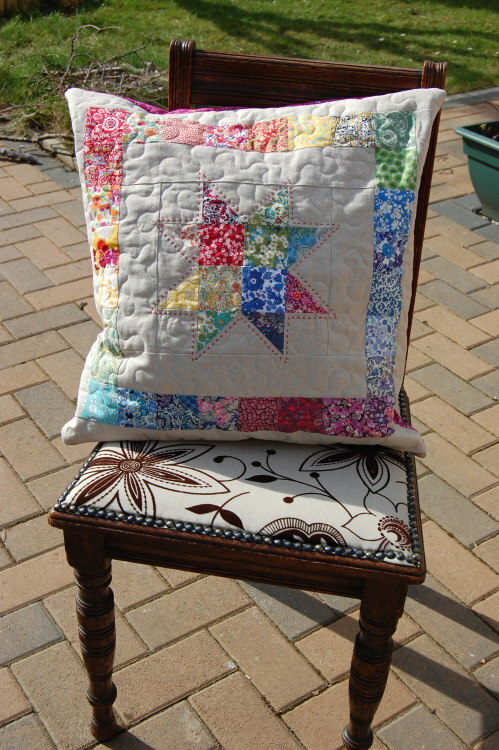 And she invented the granny squares quilt, which is on my to do list. I love her work. I had 2 rouenneries Deux charm packs – a beautiful collection from French General for Moda. I cannot get over how much I love French General fabrics, rich yet muted, classic but not old-fashioned, very very French. I didn’t want to cut too much away from the charms but 5” charms were just going to make too big a quilt (again for budget). 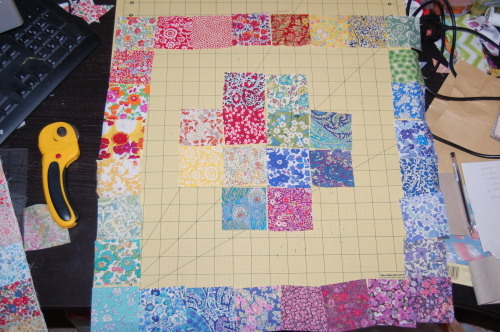 So I cut them to 4.5” – this quilt finishes at about 54” square. 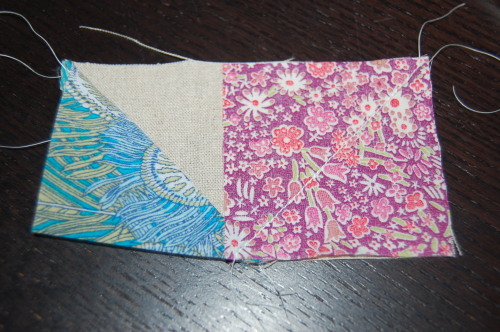 Then added a 2.5” red border from Rural Jardin which I had in stash. Definitely better. 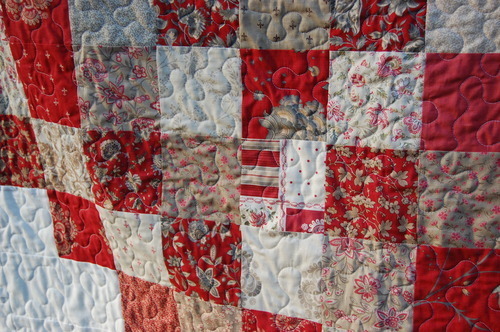 Stipple quilted – much as I like to experiment, there are reasons why classic quilting is classic, and I thought for a quilt like this I should go down that route. Had I used low-volume fabrics, straight line quilting would have worked, but I really think something as simple as this needs texture from the free-motion line, don’t you? Just LOOK at those scrumptious fabrics. It makes me want to go eat strawberry cream patisserie. New Year. Must. Resist. 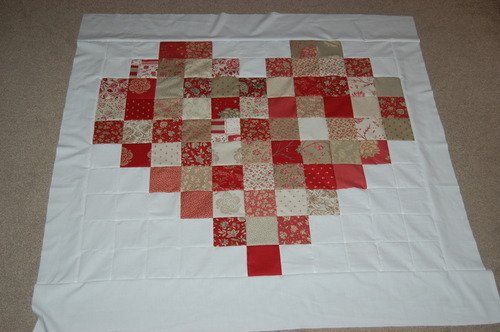 What I really like about this is the size, the fabrics and colours, but mostly the fact that although it’s a heart, it’s not too cheesy – and when you fold it up or use it, it looks like a pretty patchwork quilt; it’s only when you spread it out and look from a distance that you see what it is. Perfect for a wedding gift for this loved-up pair apparently. Ahhhh. Argghh, can’t seem to get this picture to orient the right way. Tilt your head to the right to see what it looks like draped over a box, and you’ll see what I mean about not knowing it’s a heart. 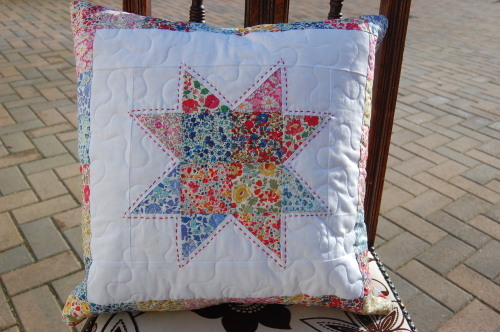 Quilted with my favourite Quilter’s Dream Orient batting. 1. There is not quite enough white space aroung the heart. 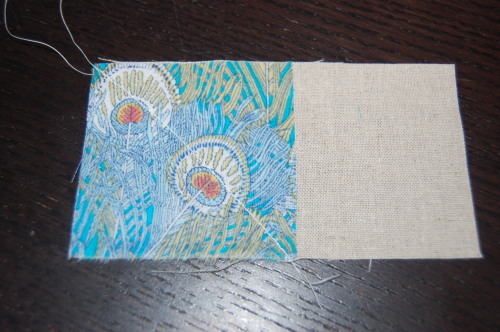 This was a budget / size thing for the backing and batting. 2. Budgetary concerns meant it has a plain white backing – it’s perfectly nice, but not as wonderful as it could have been and what the fabrics deserved. 3. It’s not for our house. Aye, there’s the rub. 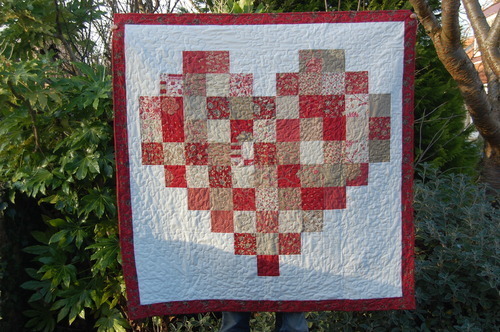 This quilt is designed and made for the happy couple but I don’t actually know the octogenerians in love, although I would like to. 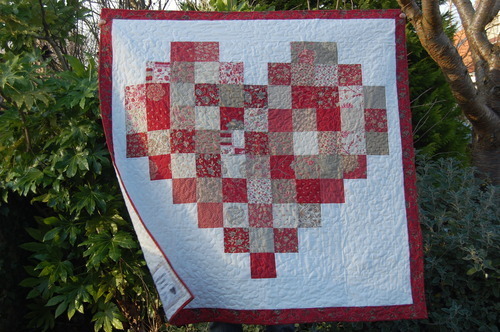 But the idea of a quilt in their new home signifying their love made me think about the pillowcases I’ve been meaning to make for my own son for ages. 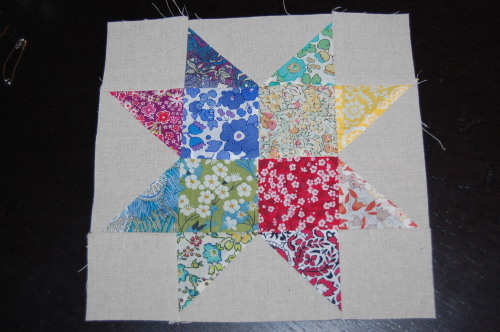 About how when I joked that a tiny baby quilt I was making was for him, he was actually disappointed that it wasn’t (even though it was tiny and completely unlike his tastes, I thought he would laugh!). It has shown me that I need to clear the decks and do selfish sewing for the next 6 months; make all those things for us that I need to, sew new buttons onto my coat etc. When you decide to sell a few things to fund your hobby, it seems that hobby can inadvertantly grow legs, arms, and heat-seeking missiles and take over your life when it wasn’t supposed to. I guess everyone assumes you want to make a living from it eventually, so think they’re being helpful by recommending you etc – and whilst it’s SO flattering and lovely, you have to be careful. 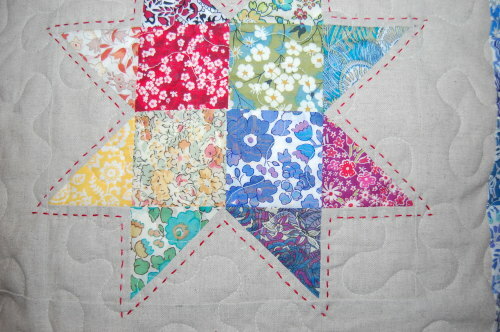 Particularly with deadlines when you’re well overdue making pillowcases with stars and trucks on. If you made a living from your hobby, it wouldn’t be a hobby would it? I definitely need to learn to say no for a while! Sometimes. And with that, may your 2015 be productive, happy and creative. May we all learn to say “no” once in a while.